Garlic Parmesan Chicken is a mild flavoured dish and it was one of the first dishes I made using the airfryer and the entire house was filled with its aroma. It smelled yummy and tasted even yummier. This chicken dish can be combined with carbs like baked potatoes or pasta with a side of assorted vegetables to make it a complete and balanced meal. Trust me, you will love it either way. I grow herbs and like to use them fresh whenever I can, but if you don’t have fresh basil, substitute it with whatever fresh or dried herb (Rosemary, thyme, oregano) you have. Dried basil just isn’t same as the fresh one. Preheat the Airfryer at 180 degrees for about 5 minutes. Lightly grease the frying tray. If you don't have an airfryer, you can use an oven. Pound the chicken breasts so that they are evenly thick. Use a fork to pierce them and marinate the chicken with pepper, salt and minced garlic. Keep it aside for about 30 minutes. In a tray or a shallow dish mix breadcrumbs, parmesan cheese and basil along with a bit of salt and black pepper. Break an egg in a bowl. Run the airfryer at 180 degrees for 8-10 minutes, After about 4 minutes see if the chicken needs a coat of butter. If it does, use a brush to lightly apply butter over the chicken and let it cook through. If using an oven, Bake for 30 minutes or until chicken is no longer pink and juices run clear. Sprinkle some freshly chopped basil leaves over the chicken just before serving for additional flavour. 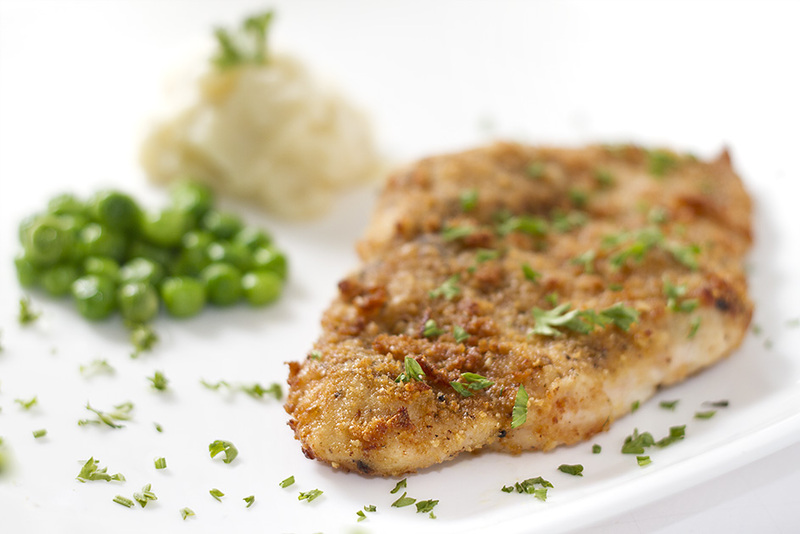 I served this delicious Garlic Parmesan baked chicken with sauteed green peas and creamy mashed potatoes.